The flexible belt conveyor systems offered by CPS take into account future developments, trends and changing production processes within industry and among our clients. The selection of components from the PVC and modular range of belt conveyors meets the demands of industry and can be added to, or exchanged for components in existing modules and other installations, thus providing new transport and handling configurations for a minimum investment requirement. CPS are Ireland’s only distributor of Dorner Conveyors. 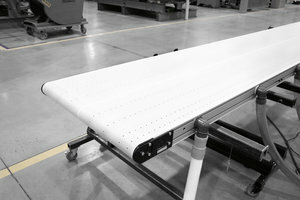 We also supply Belt and Modular Conveyors from a range of manufactures to ensure our clients needs are met.